When you make the decision to install a pool in your yard there are two main options to choose from – in ground or above ground pools in Houston. If you don’t have extra space and prefer not to build a permanent structure you may prefer an above ground pool. There are many different choices when it comes to choosing a pool design. It is best to sit down with an experienced professional to discuss the various options. Above ground pools are the most popular types of pools available. If you have had problems with small pools that you purchased from big box stores you aren’t alone. These pools are often poorly made and can’t hold up to regular use. As a result, the pool may have ended up in the trash before the end of the season. That’s exactly what you can avoid when you get professionally installed above ground pools in Houston. Vinyl above ground pools in Houston are available in a variety of sizes and shapes. You can also choose the depth that you want and some pools may have variable depths. A professionally installed above ground pool installation starts with a meeting with your local pool representative. You will be able to ask questions and learn which types of pools are best for your particular situation. Above ground pool installations are much less labor intensive than in-ground pools. While the ground does not need to be dug out deeply it does still need to be properly prepared. Once this is done the pool construction can begin. Many small pools can be assembled rather quickly. After the sides of the pool are up the liner is installed. Additionally, the mechanical portion of the pool such as the pump and filter mechanisms can be prepared. Once water is added to the pool the pump and filter will become functional and the pool will be treated with chemicals. Your above ground pool will soon be ready for use. You will need to learn how to regularly test the water and apply chemicals or you can schedule regular pool maintenance through your pool company. Your pool requires regular care to keep the water clean and safe. The use of chemicals is a necessary part of maintenance. You must also regularly remove debris from the pool using a skimmer net and vacuum the pool to keep it sparkling clear. These tasks are not difficult but you may find them time-consuming. If you prefer, you may opt to hire your pool company to perform regular cleaning and maintenance functions for your pool. 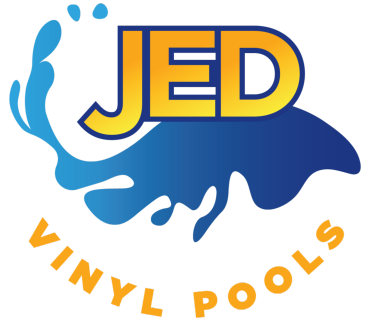 JED Vinyl Pools is a local Houston company specializing in vinyl pool installation, service and maintenance. You can count on our experienced team to help you choose a pool that fits both your needs and your budget. Then, we can assist you in keeping your pool beautiful and ready for a dip whenever you’re ready. Contact us today to learn more and to obtain a free estimate.